If you’re looking for a really spectacular and unique location for your next corporate seminar or management get-together, Clearwater Island Lodge is an ideal venue for your corporate group. We have everything you’re looking for – a remote, yet comfortable lodge with fully guided sports-fishing experiences. You and your workmates will enjoy a high quality, personalised fishing adventure with spectacular wilderness backdrops. Your meals will be 5-star quality and your accommodation will be air conditioned and very comfortable. 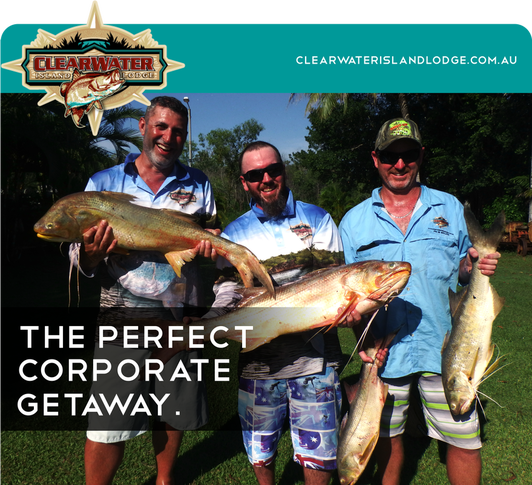 At Clearwater Island Lodge, we will ensure that your corporate group’s needs are met and will work together with you, in order to tailor-make a memorable corporate experience. Should you have 14 or more people in your corporate group, we are happy to provide the lodge exclusively to you. This means that you have the full lodge facilities at your beck and call, to use as you wish for seminar meetings and presentations or special dinners. We look forward to welcome you and your group here at our lodge soon. For bookings, enquiries and other concerns, drop us an email at fish@clearwaterisland.com.au, or call Michael or Kerri at +61 08 89783783.